From my college days – ’39 to ’43 – I remember Fr. Anselm Keefe’s constant companion, a dog named Betsy. Father left the campus with Betsy riding backward in the sidecar of his motorcycle. Any information on what happened to Betsy? Thank you for inquiring about Fr. Keefe and his canine companion, both of whom I recall seeing out and about on campus. Thank you, too, for reminding me of his faithful friend’s name! My memory troubles me now and again, and without your kind assistance, I fear I would have struggled to recall it. Although my research yielded no sure evidence of what became of Betsy, I was pleased to discover a photograph of Fr. 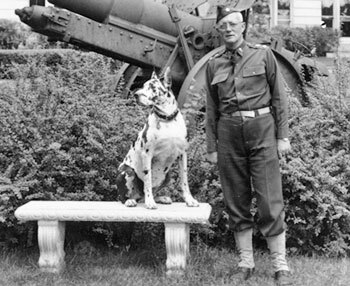 Keefe and dog taken during WWII. Betsy was the successor to a Great Dane named Bosco, who accompanied Fr. Keefe on active duty. I wonder if any of our readers can name for sure the pup pictured? My goodness, how the years grow dim! I have fond memories of Fr. Keefe, and it would please me tremendously to share a bit of his legacy at St. Norbert College with our younger readers.